A high quality hdmi cable for HDMI 1.4 / 2.0 with ethernet channel and audio return channel (HEAC). The HDMI 1.4 cable specifiction introduced a new cable construction keeping backward compatibility with previous HDMI versions by using the same type A connectors. HDMI 2.0 made no changes to cables. 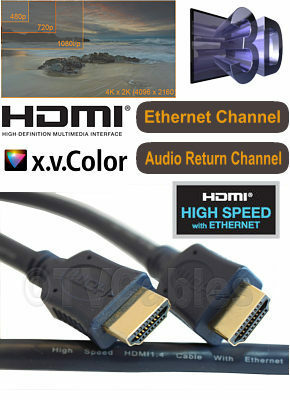 5m HDMI Cable High Speed with Ethernet Channel OFC Cable Supports HDMI 1.4 and HDMI 2.0 equipment functions. Supports ethernet channel, ethernet via HDMI. Supports audio return channel to send audio back from a display to source. Supports 3D over HDMI. Supports 720p, 1080i, 1080p, 2160p and 4k x 2k (4096 x 2160). Supports extended colour spaces eg x.v.colour. 99.99% Pure OFC copper cable. 24k Gold plated 19 pin HDMI A male connectors. 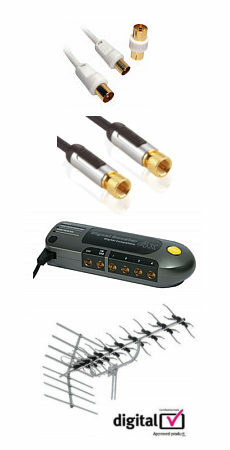 Mylar backed foil shielded twisted pairs for high speed HDMI. Backward compatible with HDMI 1.0, 1.1, 1.2 and 1.3. Ideal for connecting PS3, PS4, XBox 360 XBox One, Blu Ray DVD, Sky HD, DVD Recorders, Virgin Media HD, Freesat HD etc. Length 5 metre.